I create my art with great fondness. I have always been captivated by the distinct features of the environment around us. This layer of atmosphere enveloping us serves as a muse to my creations. Sometimes, I find myself lost and at the same time, gripped in the extensiveness and miscellany of nature. My paintings act as a window to the world inside my soul. My landscape paintings on the canvas depict true bounties of nature in their most natural from. The raw beauty of nature, in my opinion, has a calming effect on each individual and so, I often create my masterpieces keeping this thought in my mind. Vimal Chand currently live in the capital city of India, New Delhi. He is a Jamia Millia Islamia alumnus, passing out in 1993 obtaining a Master’s Degree in Fine Arts in painting. 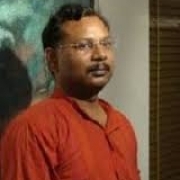 He has participated in exhibitions organized by Lalit Kala Academy, Travancore Art Gallery, Jehangir Art Gallery, and Tansen Kala Vithika amongst other places. Vimal Chand is a landscape and nature artist.